ALL AROUND NEOPIA - Quests are one of the oldest parts of Neopets. From the old quests of long ago, when you had to help rebuild time machines and fix Virtupets machinery, to the recent Illusen’s and Jhudora’s quests, quests have been a valuable source of items, Neopoints, and stats. “But,” you say, “I’ve done a few quests and mostly I only lost Neopoints!” Well, it’s all about knowing which quests pay off: when to do them, when not to do them, and how to get the most out of the quests you try to complete. In this article, I have covered Island Kitchen, Snow Faerie, Brain Tree, Esophagor, and Edna The Witch quests. There’s also information on and comparisons between Illusen’s and Jhudora’s quests, and more information on all the Uber Faerie quests. I hope that you will find my descriptions, and hints, helpful in some way. There’s just one thing I should mention. You can only complete ten Kitchen quests, or ten Snow Faerie quests, or ten Edna quests, or a mixture of all three, in one day. Keep this in mind when you decide what quests you want to do - if you do ten Edna quests, and then decide you want to do some kitchen quests... Well, you will have to wait for tomorrow to arrive. Location: Mystery Island main map. Limit: Ten quests per day, including Edna and Snow Faerie quests. Description: The Flotsam Chef originally cooked for the royal family of Maraqua. When the whirlpool destroyed his home, he moved to Mystery Island where he now cooks for the impatient Mumbo Pango. If you help him find the ingredients he needs for his recipes, he’ll reward you. These are my favorite quests, because I’m a crazy battler and your neopet can gain stats from them. The Chef usually asks for three to four items of food, with a time limit of two to three hours. - Neopoints: usually about 1000 Neopoints. - An item: usually worth between 1000 and 50000 Neopoints. You can get more expensive items, even un-buyables, but this only happens rarely. - When you arrive at the kitchen quest page, it will state the recipe being made in nice bold letters; for example “Spiced Kippers with Yeast Pancakes.” This does NOT affect which items you will be asked for. - If you’re not into the Battledome, or aren’t making more than about 50,000 Neopoints each day, don’t do the quests which will cost you more than 3000 Neopoints. The chef won’t hold it against you if you come back two hours later to try your luck on a different quest. -Unless you’re making more than 150,000np each day, I wouldn’t do quests that cost more than 10,000np. - Once you’ve done your “ten quests each day,” you can do more quests when a new Neopian day starts; it’s not timed from when you last or first did one of the days ten quests. Location: Taelias igloo, on top of Terror Mountain. Limit: Ten quests per day, including Kitchen and Edna quests. Description: Taelia is working on a spell - an important spell! It’s too cold for the poor, fragile, delicate - or just plain lazy - Snow Faerie to venture out and find them. If you collect them for her, she will reward you with an item. Taelia will ask you to find three to four items, in a time limit of about one to two hours. Rewards: Taelia usually gives you some Neopoints - between about 500 and 2000 - and an item. This item is usually a Battledome weapon, a negg, or a rare food. - Taelia will sometimes give you rubbish. Giving her an expensive negg and getting a peach snowball can be, needless to say, extremely frustrating. To save on your losses, it’s recommended that you don’t do quests that will cost you more than 4000 Neopoints. - If you’re a newer player, and still learning how to effectively make Neopoints, these quests probably aren’t for you. Of five people I asked on the neoboards, not a single one of them said that Taelias quests were worth it more than “sometimes,” and “sometimes” isn’t really good enough if you can’t afford to do lots of her quests. Limit: You can only complete one Brain Tree quest per day. Description: The Brain Tree - yes, that big pile of goo sitting in the tree is a brain- likes to collect facts. He wants you to find out when a specific Neopian died, and where. When you return to him with the information, he will reward you. Oddly enough, even though he wants to “find out” the required information, he knows if you’re wrong! To get the information you need, you must complete two Esophagor quests (see below). When you complete each quest, the Esophagor will tell you one of the two pieces of information you need to know. Incidentally, when you complete a Brain Tree quest, you receive Neopoints and an item. Based on how many Neopoints you get, you receive a score for that quest. If you do well enough, you may be able to get into the high scores and win a trophy. Unfortunately, the amount of Neopoints you receive is random. -The first time you complete a Brain Tree quest, you get the Brain Tree as a Battledome challenger. -Each time you complete a quest, you receive a random amount of Neopoints and one item (usually a Battledome item). -In the past, there were set times and places for each deceased Neopian. However, these answers are now randomized - so you can’t just ask someone else who was sent to find the same information! Not only that, but even if you do get the right answer by chance, you still can’t complete the quest until you have fed the Esophagor twice. -The rewards for the Brain Tree quest are rather pathetic. Unless you have a large amount of money and want to try getting into the high scores, or you need to get the Brain Tree as a Battledome challenger, don’t bother with these quests. -If you do decide to do these quests, I suggest that you don’t spend more than 4000 Neopoints on the first Esophagor quest- if you get asked for something really expensive the second time round, you’ll have wasted your Neopoints. -If, having completed the Esophagor’s two quests, you find the Brain Tree won’t accept your answers, it may be because the answers are case sensitive (and yes, it does matter whether you put a space between the year of death and the “BN” part!). I suggest writing down the answers you get, very carefully, when you finish each Esophagor quest. Description: Aaargh! It’s a... a... a... Giant sapient moving pile of sludge??!? Well, whatever he is, the Esophagor is hungry - always, sooo hungry. If you bring him food, he may reward you: with information if you’re on a brain tree quest, or an item if you’re not doing a brain tree quest. The Esophagor usually asks for one to three items, which you have to find in one to two hours. Find them, and he will give you an item. These are often quite good items, although he will sometimes give you rubbish like a Smashed Cheery Blossom. Doing Esophagor quests simply for the item rewards can be quite profitable. For example, I spent a hundred Neopoints on Pumpkin Cookies to give to the Esophagor, and he gave me a Double-Headed Uni Plushie (worth 17000 Neopoints) in return. Don’t be too rash to do these quests, though - I once spent 15,000 Neopoints on food, only to be given Robin Lupe (worth 1000 Neopoints) in exchange. - One piece of information, if you are. - I don’t recommend doing these as part of the Brain Tree quests (see above). If you do have to complete a Brain Tree quest, see the hints & tips section of the Brain Tree quest information. - If you’re doing Esophagor quests for the item rewards, I recommend doing as many quests costing under 3000 Neopoints as possible. Limit: Ten quests per day, including Kitchen and Snow Faerie quests. Description: Edna the witch needs ingredients for her spells - quickly, or else the magic will be lost! Starting to sound familiar? Do we have a strange sense of deja vu? Find Edna her one to three items within one to two hours, and she will reward you with Neopoints (sometimes) and an item of food. If you’re very lucky, you might even get the Edna - *Cackle* avatar. A while back, when there was no spooky food shop, all the items you needed for the Esophagor, you had to get by completing Edna's quests. (Either that, or by using the shop wizard). This meant that her prizes were quite rare and expensive, and her quests were worthwhile even if you weren’t doing one for the Brain Tree. Now that the spooky food shop has been in business for a while, though, the items she gives out are rarely worth more than a hundred Neopoints. You might occasionally get a very rare, unbuyable food item, but that will hardly ever happen - and the kitchen quests you miss out on when you complete Edna quests are more worth your time. The only real reason to do Edna quests now is for the avatar. - About zero to two hundred Neopoints. - An avatar - this is a rare random event you get when completing an Edna quest. I’ve seen people who have completed more than a hundred Edna quests but still don’t have the avatar, so don’t get too hopeful! - Edna’s spells have many different names. These names DON’T have any bearing on what sort of items you get asked for. For example, while researching this quest, I was asked to find B-B-Q Pork for a “Bubbling egg of Chia Transforming” spell. A lot of refreshing later, I was given the opportunity to do the same quest. The second time, however, I was asked for Thornberry Tea and Super Shiny Shampoo. - Seeing as most of the time you won’t get a prize worth more than 300 Neopoints, I would suggest only doing quests under 1500 Neopoints. If you already have the Edna - *Cackle* avatar, I wouldn’t bother doing these quests at all. Description: Illusen, the reclusive earth faerie, needs you to find her some items! Nobody knows quite what she wants them for, but if you complete enough of her quests, the rewards can be great ones. Illusens quests, like Jhudora's, are in the form of levels. Each time you complete a quest, you gain a level (a quest level, not a stat for your neopet). Beware, though! - if you fail a quest, you get put back to the level one quest. Each level, Illusen will ask you for one item, which you have to find in fifteen minutes. When you complete most of the quests, you won’t get anything - at certain levels of quest, however, you will receive an item. As you complete higher levels of quest, you will be asked to find more and more expensive items - however, Illusen will also give you better rewards. Rewards: These are the rewards for Illusens quests. The first number is the level at which the item is obtained. Next is the items name, information about the item. I considered putting the price of each item in this list as well, but decided against it because the prices of all Neopian items are constantly fluctuating. Level 1: Illusens Cream Cookie. Food. Level 3: Illusens Potion. A weapon that can be used once per battle, doing a pathetic amount of damage. Level 5: Illusens Comb. A grooming item that will make your pet happier. Level 8: Cucumber Eye Cream. Another grooming item. Level 11: Illusens Novel. Read this book to your neopet to make it smarter. Level 14: Mud Mixture. Another Battledome item. This one does a little more damage and heals your pet one to four hitpoints (you can use it once per battle). Level 17: Flower Cake. Food. Level 20: Rain Water Shampoo. A grooming item, and the Quester For Illusen Avatar. Level 23: Rose Shake. Food. Level 26: Earth Spell Book. A book. Level 29: Leaf Shield. This multi-use Battledome weapon is an excellent shield, protecting your neopet from earth, water, and physical attacks. I highly recommend it- it’s excellent for its price. Level 32: Illusens Earth Potion. A once per battle weapon with a fairly nice attack. It’s a nice buy for its price, and most battlers will use it for a time. Level 35: Honey Potion. This is the prize which most people do Illusens quests solely to get. This is a once per battle weapon with a good attack. At the moment it sells for about 650,000 Neopoints - and it’s worth every bit. Level 38: Illusens Scroll. A book. Level 41: Illusens Blade. A multi use weapon that does five earth damage, and one to six physical damage. For 1,200,000 Neopoints, it’s only value is it’s rarity. Get a Scuzzys Comb or Ramtors Spell Book instead, if you’re looking for a battle item in this price range. Level 44: Leaf Taco. Food. Level 47: Illusens Orb Plant. Gardening. Level 50: Illusens Staff. This weapon is fairly amazing... It’s multi-use, and heals your neopet whenever its health is in the red. It reflects all dark attacks back at your opponent, does a fair fourteen to twenty icons, and doesn’t “count” as a healing item. However much you end up paying to Illusen, it’ll be worth it- if you get it. Getting it is hard. Very, very hard. Hints, tips, and additional information: The main problem with Illusens quests is that if you are asked for an item which is too expensive, or UN-buyable (and nobody is online to sell it to you), you end up being set back to level one, losing all the Neopoints you had invested so far. It’s a game - a game of calculating risks. Some people say it’s worth it, some people say it isn’t. - Have your Neopoints out and ready! Moreover, make sure you have about 250,000 Neopoints on hand before you start any of the later quests: if you do get asked for an unbuyable on quest 35, but you’re just short of Neopoints, you’re going to be really, really, annoyed at yourself. - The faster you complete each quest, the higher your score- so if you’re going for a trophy, go as fast as you can, and have a shop wizard page open before you start. - Write a general, fill-in-the-blanks letter. Make it polite, and explain that you’re on an Illusen’s quest. If you get asked for an unbuyable item, have it ready to send to anyone selling it on the trading post. -If you do a quest for Jhudora, you can’t do one for Illusen for half a day, and vise versa. Limit: You can only attempt one quest every twelve hours. Description: Yes, it’s the dark faerie with the purple and green fixation. She wants items. You bring the items, and she’ll reward you with UBER MAGICAL ARTIFACTS OF GREAT POWER AND DOOMISHNESS, one of which happens to be a hairbrush, but, um, we like, um, don’t mention that. These quests are exactly the same as Illusen’s - with the exception of being harder (Jhudora asks for rarity 99s earlier) and with prizes being given out at later stages. It’s much more common to fail these quests, so I would recommend doing Illusen’s quests instead (do NOT tell Jhudora I said that...). That said, Jhudora’s Potion IS a nice bomb, and you can sell it for about nine million Neopoints. It could turn out to be hard to sell though, and you may spend nearly that much getting it. To try, or not to try? Personally, I say no - it’s just too risky. However, if you do happen to have a spare fifty million Neopoints around, by all means, feel free to try for the Wand Of The Dark Faerie (not to be confused with Jhudora's Wand, which was sold in the hidden tower). Level 1: Poisonous Lollypop. Food. Feeding it to your neopet will cause it to catch a disease. Level 3: Noxious Nectar. A useless, once per battle, weapon. Level 5: Jhudoras Brush. Grooming item. Level 8: Purple Blob Potion. A slightly less useless weapon, that can also be used once per battle. Level 11: Jhudora T-Shirt. Clothes. Level 14: Gnome Shroom. Food. Level 20: Dark Faerie Magic, a book & the Quester For Jhudora Avatar. Level 23: Malice Potion. This potion can only be used outside the Battledome. If you feed it to your neopet, it will either get sick (with blurred vision), or be healed three hitpoints, or nothing will happen. If you need healing, just buy a healing potion for a fraction of the price, or visit the healing springs. This item is interesting, but only good for selling. Level 26: Purple Spotted Shroom. This shroom can only be fed to your neopet outside the Battledome. It will either heal your neopet three hitpoints, or give it one permanent hitpoint, or give it one permanent strength point. With a few exceptions, it’s better to just sell these to rich and crazy people, and train using the training school and Krawk Island academy. Level 29: Clockwork Rat. Toy. Level 32: Toxic Shroom. A mystic mushroom that doesn’t appear to do anything. Level 35: Dark Shroom. Another mystic mushroom that doesn’t seem to do anything. Level 38: Jhudoras Potion. A once per battle weapon that does a rather nice amount of damage. At nine million Neopoints, this is a nice item to win - however, I wouldn’t keep it. There are better bombs than this, and for an extra million Neopoints you could buy a Sword of Skardsen, which does nearly the same thing but is multiple use. Level 44: Dark Faerie Collar. A multiple use weapon which does a fair amount of damage, defends some light, and reflects a quarter of your opponents dark back at them. At ten million Neopoints, though, I don’t think it’s worth the price (just sell it). Level 47: Portable Cloud. This multiple use weapon does a fair amount of damage (the same amount as the Dark Faerie Collar, and the common weapons Scuzzys Comb and Ramtors Spellbook). It’s icons are also hard to block, and for a bonus, it has a little earth defence and can give your opponent watery eyes! If this had a price tag of about a million Neopoints, it would be quite a steal - unfortunately, it’s many times that amount and not worth keeping as a weapon. Sell it, and get something else. Level 50: Wand Of The Dark Faerie. Ooooh, sparkly! This multiple use weapon does more damage than Illusens staff, also heals when your Neopets health is in the red, but reflects (100% of) your opponents light attack, instead of dark. Again, it doesn’t “count” as a healing weapon. It’s debatable whether Illusens Staff or Jhudoras Wand is a better goal - Illusens staff blocks a more commonly used icon (dark), and is easier to get... But Jhudoras wand does more damage. It’s up to you - if you can afford to even try for one of the two, you’ll have your battling style all sorted out by now. Hints, tips, and additional information: All the hints & tips for Illusen’s quests (see above) are basically exactly the same for Jhudora’s quests. Just bear in mind that because Jhudora’s quests are harder, you may be asked to find unbuyables sooner... So be ready! If you’re new to Jhudora’s and/or Illusen’s quests, I recommend doing Illusen’s quests first, for practice. Description: As you may have seen with Illusen and Jhudora, these faeries seem to be incapable of doing anything for themselves! Personally, though, I think it might just be that they want to give us a chance to do something interesting. At any rate, sometimes the Uber-Faeries need you to bring them an item. You will get a quest from one of them as a random event. If you can find the item for them - without using the shop wizard - they will grant you a reward. There is no time-limit to these quests. You can refuse to do these quests - however, if you do, Fyora the faerie queen will ban you from receiving one for five minutes. Big deal? No. However, if, after the five minutes have gone, you don’t visit the faerie quest centre again (you can find this in Faerie City) then you still cannot receive new quests! So you could end up “banned” from getting faerie quests for several months. For that reason, I suggest doing all the quests you are given. Luckily, every single one is always worth doing - with the possible exception of earth and air faerie quests. Air faerie quests only make your pet faster (agility does nothing, although it looks nice on your pets lookup) and earth faerie quests only heal and feed your pet (making your pet gain weight: but this has no effect). Both of them are cheap though, so I would just do them anyway and not risk being banned from doing quests. Air Faerie Quests: One of your Neopets will gain an agility point. Worth doing, although I wouldn’t exactly rejoice at being given one. Earth Faerie Quests: One of your Neopets will be fed and healed, and will gain weight (just a pound). Worth doing, although they’re not that great. Handy if your pet is sick or has just lost a battle. Fire Faerie Quests: One of your Neopets will gain a strength point. I LOVE THESE QUESTS! If you get one, do it, and be happy for the rest of the day. Water Faerie Quests: One of your Neopets will gain a defence point. Light Faerie Quests: One of your Neopets will gain a level. These are my second favourite quests, after the Fire Faerie ones. Dark Faerie Quests: One of your Neopets will gain a hitpoint. These are excellent value to everyone except possibly people who use the lab ray- in which case these quests will only cause the gap between your Neopets hitpoints and other stats to increase further. I would still do these though, no matter what your situation. Faerie Queen Quests: Ooh, these are rare. If you complete these quests, Fyora will grant your neopet three strength points, three hitpoints, and one level! Space Faerie Quests: These are rare too - and sometimes quite expensive. They’re almost always worth it though, because the Space Faerie will grant your neopet four levels. Fountain Faerie Quests: If you get one of these, run around hugging people. When you find the Fountain Faerie her item, you can paint one of your Neopets for free at the rainbow fountain! - Look up the item you’ve been asked for by typing its name into the box in the yellow sidebar. Have a look in the shop it originates from to see if it’s in stock. - Post on a board in the quest chat, or in your guild, asking if someone will (please and thank you) search for the item on the shop wizard and tell you the name of the person selling it at the cheapest price. If you want to post in your guild, remember to check your guilds rules. Some guilds only like people to post long posts, or actually frown on posting. - Sometimes people will say things like “it’s in my shop, have a look.” Unless you know roughly what price the item is supposed to be, I wouldn’t buy it from there- some people will overprice their items, hoping that people on quests will buy them. - If you can’t post on the message boards, then try searching the trading post. You can compare prices there and bid on one of the items you find. Before you bid on someone's lot, I would recommend visiting their userlookup. If their “last spotted” status is anything longer ago than “under a day ago,” I wouldn’t bother bidding on their item. - If you want to get a lot of these quests, play Neoquest II. Not only do you get a nice amount of random events playing, but if you manage to finish the game you’ll get a spiffy trophy, and some nice prizes (at least, on evil and insane levels). - If the Earth Faerie asks you for a healing potion, you can find these in the Healing Springs as well as in the magic shop. Well, that concludes my guide to quests. I hope you found it useful in some way! I certainly learnt some interesting things while I was writing it, and managed to answer some questions which had been lurking in the back of my mind for a while. I have tried to make sure all my information is as accurate as possible. Good luck with your quests, and thanks for reading! Keep this in mind when you start, the reward is great because you are playing for one of the longest time periods of any Neopet’s game. Gnarled tree branches hanging over their heads cast shadows that seemed to surround and trap them. A loud gust of wind rustled the trees. It didn't hurt to exercise, but she just really didn't like it... Why waste all that time when you could read? 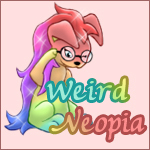 The Mynci sat down on her beanbag chair as she admired all the hand-made Neopian Times Quills in her room. Then she opened the book and started to read again.